The Evening Echo caught up with Ireland's number one, Shay Given, just before Newcastle's disappointing 2-1 defeat in the FA Cup against Liverpool at Anfield. County Donegal has provided Ireland with two of its most celebrated and most-capped goalkeepers in Packie Bonner and Shay Given. Both made the journey across the water to join Glasgow Celtic and their youth set up while still in their teens. But while Bonner remained a one club professional, Shay Given departed for Blackburn (and then Swindon and Sunderland on loan) before settling with Kenny Dalglish's Newcastle nearly seven years ago, quickly making the number one jersey his own. If that much is common knowledge, recent revelations that Shay turned down the mighty Manchester United (and Frank Stapleton's Bradford!) to head for Glasgow, were less so. "I was on trial for a couple of weeks at Manchester United before I joined Celtic, but I got injured after only a few days and they looked after us really well. I could have gone there as well, but I decided to go to Celtic where Liam Brady was the manager and Packie Bonner was the goalkeeper. "I had the chance of doing something up there at Celtic, whereas Peter Schmeichel was the goalkeeper at Manchester United and would have been quite young, so I didn't think there was any chance of getting in there. I've few complaints to be honest with you, things worked out for me." And on turning down Irish legend Frank Stapleton while he was manager at Bradford: "Yeah, I went there for a period on trial as well, I played in a youth tournament for them at Leeds, and Frank was the manager then and was interested as well." Seamus Given was also a keeper in his day, and as Shay reveals, shaped his son's early playing career. "Yeah, as a young lad he was always giving advice to me, and he really helped me… well, decided I should go to Celtic more or less, and you have to do what your Da has to say when you're 15!" "Maybe I would have picked Man United as a young kid at 15… but then maybe I wouldn't have been nearly as successful or picked up so many caps for Ireland. And to be honest with you, I think these things happen for a reason, and I've no regrets at all." It also emerges that the man who would have blocked Shay's path to the first team had he joined United, was his all-time hero: "Peter Schmeichel was the ultimate one for me and a real legend; his gloves and jersey take pride of place at home from when I played against him when he came back to Aston Villa. He's a legend in my eyes." Other heroes to get a mention include Ireland's current goalkeeping coach: "Packie Bonner too of course, coming from Donegal and watching the Ireland games." On David Seaman's recent retirement: "Ah yeah, he's a class keeper too, he was a great keeper, and I've his jersey at home too, but Schmeichel's the real hero for me." Seamus Given once predicted his son would play for Ireland before he turned 21. 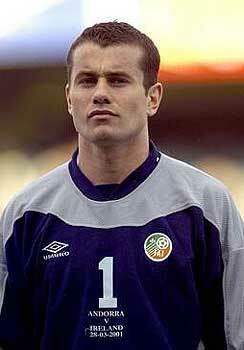 Mick McCarthy obliged by selecting Shay for his debut against Russia aged just 19 in 1996 ("yeah, that was superb"). Packie Bonner was 21 before achieving the same feat and went on to win 80 international caps. Dean Kiely was 29 years old, but how does Shay feel about the Charlton keeper's decision to concentrate on his club career? "I wanna play every game for Ireland, ya know, so I'm not that fussed. On a personal level I wanna get as many caps as possible. Obviously Dean made the decision to pack it in, and you'd have to ask him why that was, but I can only look at it from the point of view of my own situation, and I wanna play every game for Ireland." With Kiely gone, Shay's honesty continues on the question of who might emerge in the long-term to threaten his hold on the Irish jersey. "I don't know, but when you look at Nicky Colgan (Hibernian) and Joe Murphy (West Brom), they're both great keepers but they're not getting games for their clubs, and they need to get in there and playing first team football. "I know Paddy Kenny at Sheffield United has Irish connections, and they might look at bringing him in, and he's been doing exceptionally well at Sheffield United. Graham Stack (Arsenal) is getting some games and he looks comfortable, so we do have some good young keepers coming through, and I'm getting old, I'm pushing on now at 27! But the goalkeepers stick together of course…"
Speaking of goalkeepers sticking together, Shay hadn't read the recent comments from Bob Wilson, labelling him a 'truly great keeper', drawing particular attention to his incredible reflexes and reaction times. Wilson also compared Given to the great Gordon Banks. "Was he drinking at the time, no?" "Obviously it's great to hear something like that from such a well respected and great keeper of class himself who's still involved in the game, but…" his voice trails off with modest embarrassment. Matters of interest to Irish fans, such as the upcoming visit of Brazil to Lansdowne Road, represent safer ground. "Yea well, they're the World Champions, so of course we're looking to test ourselves against them. It's a game we're looking forward to. It'll be a tough game for us, and we don't want to put too much pressure on, but it's one we're looking forward to." And on facing France, Switzerland and the rest in the World Cup qualifiers next season: "Aye, the draw was interesting, and it's a tough draw, you know, but the games don't always go the way you'd expect them, they're tough to predict. And obviously France will be hot favourites, so that'll be tough. A lot of games are hard to predict, like when you look back over our last campaigns as well. France was probably one of the toughest teams to draw we could have got, and the Swiss are well known to us already. But we're looking forward to it." With the stadium issue at long last looking resolved, Shay hadn't seen the plans for redeveloping Lansdowne Road ("you hear different things over here all the time"), but was eager to hear of the latest news from Ireland. In a scenario where the FAI may fail to gain a derogation on the temporary seating ruling, we look at the stronger alternatives. "Superb Stadium. Yeah, I saw Donegal play there in the semi of the All Ireland, and it’s just a magnificent stadium. It wasn't the Croke Park I knew from the past. The stadium is amazing there now; it'd be good to play our games there." 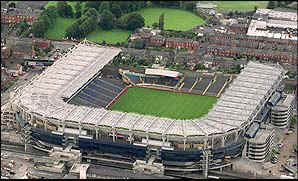 So Croke Park as opposed to one of the stadiums in Britain. "Yeah definitely, and obviously the players' preference would be to play the games at home in Ireland, in whichever stadium. You want to play your home games in Ireland." Shay followed the fortunes of the Under-20s in the World Youth Championships in the UAE, "I did, they came back strongly against Colombia having been 2-0 down and forcing the game into injury time before losing in extra time. They're going very well." "And we need more players coming though, it's very important some of these players come through cos we haven't got the biggest pool of players to choose from, we haven't got the biggest of squads." Not surprisingly then, some of Ireland's hotter prospects get high praise: "We saw Liam Miller in training with Ireland for the last squad and I've seen him play for Celtic on TV you know. He looked very good obviously before his injury and not being able to play against Canada, but he's a brilliant player - Manchester United don’t sign many bad players!" "There's a lot of excitement and hype surrounding him back in Ireland, so you just hope it all goes well for him. Big things are expected of him." Shay's thoughts turn to Colin Healy who picked up 13 caps for Ireland before his injury, "It's a shame, he was just getting up his match fitness, he was looking really good, it was a bad injury and that, ya know. "He’s a very solid player, and was looking very strong up until the time of his injury. And he was also becoming a first choice for Ireland. So you just wish him all the best and hope that he comes back as strong as ever." At least Healy has time to rehabilitate and recover before the World Cup qualifiers next season. Andy's Reid prospects look more immediate: "Yeah he looked superb against Canada, he was brilliant, and it was only his first game as well." "I played behind him for the game against Canada and he looks a good talent, and we just need players like that to develop. I understand Spurs could be in for him again soon although they just picked up Michael Brown from Sheffield United who looks good too, so who knows." And Brian Kerr is taking the national team in the right direction having done so much to revive the last campaign, "Yea, obviously it was very disappointing that we couldn't make it for the manager, but we got off to such a bad start that it was always going to be difficult. And we're putting in some solid performances now." The same could be said of Newcastle where Given makes his living, with slow starts and then gradual improvement over a season the feature of Bobby Robson's three-year reign as manager. "Yeah, obviously we would have liked to have started better, but we had a good win against Southampton in the FA Cup [Newcastle subsequently lost to Liverpool in the fourth round], and good results against Manchester United and Fulham in the League. But we often start the season slow, as was the case over the last couple of seasons. It's something we'll have to work on." "The defence is now looking very solid, with Jonathan Woodgate and Andy O’Brien in particular putting in some great performances. Obviously the aim is for a Champions League place, and we’re looking to get in there, but so are Liverpool and Charlton. And we're still in the UEFA Cup." The good run coincided with comments from Newcastle Chairman, Freddie Shepherd, at the end of last year: "The players of this football club are given Rolls-Royce treatment, but we're not getting Rolls-Royce performances in return." Did the criticism hurt their professional pride or was it the players and manager who should take credit for turning things around? "Well the Chairman wasn’t saying anything the players didn't already know, and I'd say it was a bit of both in terms of getting things back on track. The manager is touching 71, but hopefully will stay on and is on a 12-month rolling contract. It's probably a case of rolling out of bed each morning and continuing in the job." An inquiry of how the player views his own strengths and weaknesses get the only curt reply: "I don't do weaknesses, man. I don't have any weaknesses - positive mental attitude. Strive to improve, but I don't have any weaknesses!" Coming from a man who left the security of the family home to earn his living in another country aged just 15, establishing himself as his country's number one in the process; it's hard to argue.